So, are a believer yet? Eagles win in dramatic fashion beating Green Bay 20-17 in Overtime! How many of you thought the season was over after the Eagles fell behind 14 - 0 in the first quarter? When did you first think the Eagles were going to win? Be truthful. Not until the field goal went through the uprights in overtime. Right? The game was a nerve racking , scream at the TV, jump up and down type of game. If you still have a voice, you might want to check your blood pressure. Mine is up. This is hard to handle. The excitement , the emotion is thrilling but exhausting. The Favre mistique is over. The Eagles are the team of Destiny and have been. The game mirrored the season. You look at the final score and how they played in the first half and you say to yourself, how did they win? The answer is Destiny. Donovan had another huge game. He rushed for 107 yards on 11 carries. He was 21-39 for 248 yards and 2 TD's. He all but carried the team on his back. The second TD pass to Pinky will be a highlight reel for years to come. Like some of the Randall plays in the past. Freddie had a big game with the biggest catch of the year coming on a 4-26 yards late in the game. Donovan hit him with a perfect 28 yard strike and Freddie made a great catch. Duce had 5 carries for 45 yards and a key run in overtime. He was not to be denied. Unbelievable determination. Dawkins with a game saving interception. Pinky had a big game. 7 catches 95 yards and 1 monster TD catch. Chad Lewis had a nice game with 4 catches and 37 yards. But my favorite highlight , as always and also the turning point of the game, was the goal line stand at the 1 foot line at the 2 minute mark. I love defense. Give some props to a little know DT Sam Rayburn for the stop. 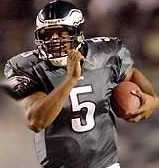 And what about the gunslinger, Andy Reid, when he want for 4 and one for their own 30 yard line. He would have been roasted by the media if they didn't make it. Next week , we face Carolina at the Linc. I hope that game is an easier win. I'm getting too old for this kind of excitement.